My die cut nautical anchor and stars project today was made for the Impression Obsession “It’s a Guy Thing” design team challenge to create a masculine card. I used the Anchor and Stars sets for my clean and simple card. I cut the anchor in both red and white cardstock. I trimmed the white rope off and attached the pieces of rope to the red anchor using glossy accents. The stars were cut using red cardstock. Crimpers were a big deal when I first began paper crafting back in 2003. Although they are not really popular to use any more I still keep mine close at hand in my craft room because I love to use it to add dimension and interest like on my card today. I cut the white layer, tucked it in my crimper and rolled it through. I attached it to the red layer using double stick tape and then attached both to the white card base using strips of mounting tape. Both the anchor and stars were attached to the crimper layer using small pieces of mounting tape. I think popping images up rather than attaching them flat adds lots more interest to the project. I hope you have enjoyed seeing my clean and simple die cut nautical anchor and stars card. Why don’t you come along and play in the challenge. 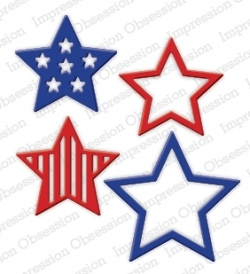 You can check out all the details for the challenge on the Impression Obsession blog. You will definitely want to check out all of the masculine projects by the design team. Very nice Kittie…clean and simple…so funny I just used my crimped last week…I crimped a Sizzix Wonky big dog…we always keep mine as well…but I really do need to purge a lot of stuff…come help me. Very striking card… Thank y ou for sharing. What a super CAS guy card. I haven’t used my crimper in ages. Thanks for inspiring me to dig it out. Great card and reminder to use my crimper more – Thanks!